Deliziosa con questo cappellino! E mi piace molto anche l'outfit. Hi Lilli, your cat shaped beanie is similar to the pink cat beanie worn during the Women's March. It's so cute. Have a wonderful day. Due pezzi fantastici, sia ila felpa che la gonna!!! Ah so cute, I want this beanie. Also the sweater is pretty nice. I got a Faible for ruffles at the moment. Such a cozy Outfit, dear Lilli. Very relaxed. Enjoy your evening. Bellissimo l'abbinamento, e il cappellino è veramente delizioso! 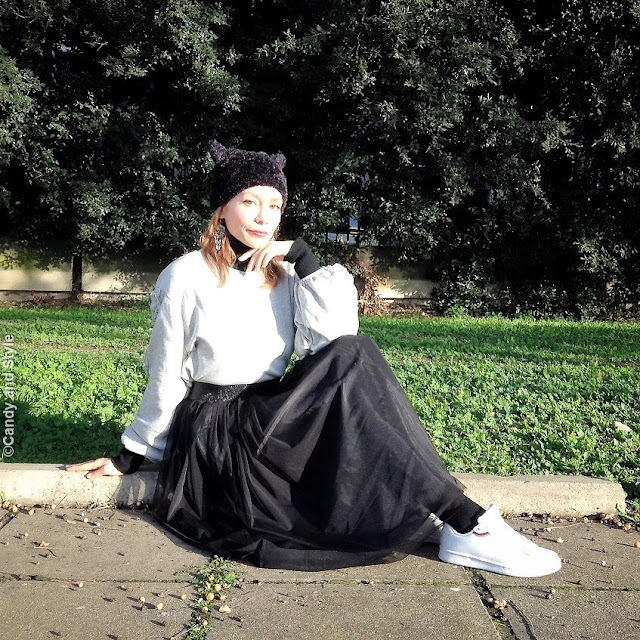 So cute beanie, I like this comfy look with sneakers, have a nice days Lilli!